Objective To compare patient outcomes of restrictive versus liberal blood transfusion strategies in patients with cardiovascular disease not undergoing cardiac surgery. Data sources Randomised controlled trials involving a threshold for red blood cell transfusion in hospital. We searched (to 2 November 2015) CENTRAL, Medline, Embase, CINAHL, PubMed, LILACS, NHSBT Transfusion Evidence Library, ClinicalTrials.gov, WHO International Clinical Trials Registry Platform, ISRCTN Register, and EU Clinical Trials Register. Authors were contacted for data whenever possible. Trial selection Published and unpublished randomised controlled trials comparing a restrictive with liberal transfusion threshold and that included patients with cardiovascular disease. Data extraction and synthesis Data extraction was completed in duplicate. Risk of bias was assessed using Cochrane methods. Relative risk ratios with 95% confidence intervals were presented in all meta-analyses. Mantel-Haenszel random effects models were used to pool risk ratios. Main outcome measures 30 day mortality, and cardiovascular events. Results 41 trials were identified; of these, seven included data on patients with cardiovascular disease. Data from a further four trials enrolling patients with cardiovascular disease were obtained from the authors. 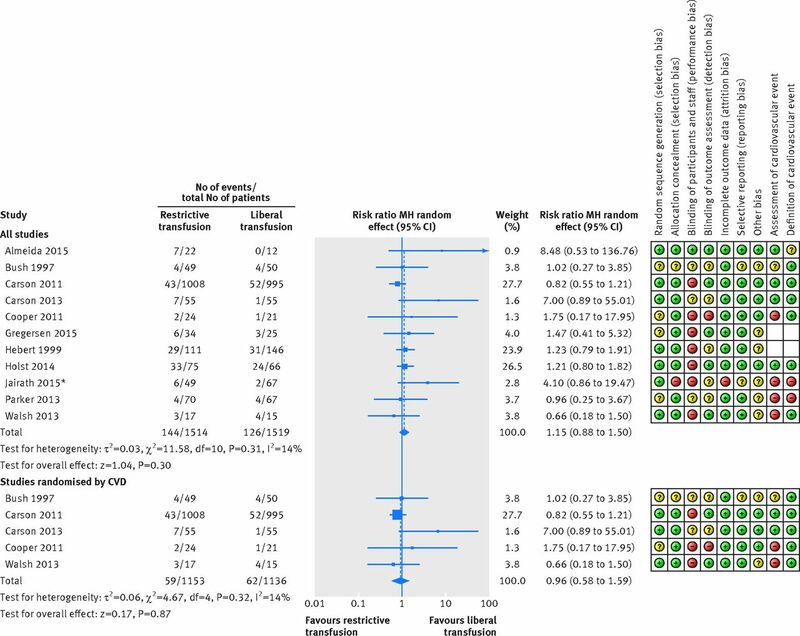 In total, 11 trials enrolling patients with cardiovascular disease (n=3033) were included for meta-analysis (restrictive transfusion, n=1514 patients; liberal transfusion, n=1519). The pooled risk ratio for the association between transfusion thresholds and 30 day mortality was 1.15 (95% confidence interval 0.88 to 1.50, P=0.50), with little heterogeneity (I2=14%). The risk of acute coronary syndrome in patients managed with restrictive compared with liberal transfusion was increased (nine trials; risk ratio 1.78, 95% confidence interval 1.18 to 2.70, P=0.01, I2=0%). Conclusions The results show that it may not be safe to use a restrictive transfusion threshold of less than 80 g/L in patients with ongoing acute coronary syndrome or chronic cardiovascular disease. Effects on mortality and other outcomes are uncertain. These data support the use of a more liberal transfusion threshold (>80 g/L) for patients with both acute and chronic cardiovascular disease until adequately powered high quality randomised trials have been undertaken in patients with cardiovascular disease. We conducted a systematic review and meta-analysis assessing the effect of restrictive versus liberal red cell transfusion strategies on patient outcomes restricted to adults with cardiovascular disease, excluding those who had cardiac surgery. We included only randomised controlled trials. Trials were eligible for inclusion if they evaluated the effectiveness of any policy involving the use of a trigger or transfusion threshold based on haemoglobin concentration (including haematocrit) for guiding allogeneic red cell transfusion. Control group patients were required to receive transfusion at a higher haemoglobin concentration or haematocrit. We considered trials including adults (≥18 years) except those who had undergone cardiac surgery as this is a distinct group of patients with a clinically significantly altered cardiovascular risk as a result of the procedure.21 We excluded children and neonates owing to the low prevalence of cardiovascular disease. In our protocol we defined cardiovascular disease as known coronary artery disease (acute coronary syndrome, chronic ischaemic heart disease) or other cardiovascular disease (cerebrovascular accident, transient ischaemic attack, peripheral vascular disease). We defined acute coronary syndrome as ST elevation myocardial infarction, non-ST elevation myocardial infarction, or unstable angina. Supplementary table E1 summarises the definitions for cardiovascular disease used by the authors of included trials. We did not restrict our search by language, date, or publication status. We updated a search strategy we conducted in September 2009, reviewing the overall use of red blood cell transfusions.22 The present search included two changes: in CENTRAL there was a date restriction, and in Medline and Embase the following search method was used: the original search strategies+original randomised controlled trial filters were rerun up until the end of 2008; the new strategies+new randomised controlled trial filters were run for all years; the results of rerunning the original search strategies+original randomised controlled trial filter until 2009 were then removed from the new search results. Once all the search results had been downloaded into bibliographic software, we removed all previously screened references from the overview of the use of red blood cell transfusion, along with any duplicates. The search strategies are available in the online data supplement. The date of the last search was 2 November 2015 for the following databases: CENTRAL (Cochrane Library issue 8, 2014): publication years 2009-14; Medline (1946 onwards); Embase (1974 onwards); CINAHL (1937 onwards); PubMed (epublications only); LILACS (2009-14); Transfusion Evidence Library (1980 onwards); and Web of Science (Conference Proceedings Citation Index-Science, 1990 to present). We searched for ongoing studies in five registries: ClinicalTrials.gov, WHO international clinical trials registry platform, ISRCTN register, European Union clinical trials register (www.clinicaltrialsregister.eu/ctr-search), and the Hong Kong clinical trials registry. All sites were searched on 2 November 2015. Supplementary appendix 1 details the search strategies. Two authors (AD and RO) independently reviewed all identified titles and abstracts against the prespecified eligibility criteria. Disagreements were resolved by discussion with the other authors. We considered all publications reporting a randomised controlled trial that used a valid transfusion threshold and where inclusion criteria indicated patients with cardiovascular disease. We contacted the authors of eligible trials that included cardiovascular subgroups or a high proportion of patients with cardiovascular disease and requested data for these patients. For trials that included patients both with and without cardiovascular disease, we ascertained whether randomisation was stratified by the presence or absence of cardiovascular disease. Data were extracted using a form piloted before the study. Two authors (AD and RO) independently extracted data on trial characteristics, primary and secondary outcomes, cardiac specific morbidity, and general morbidity. A third author (SS) checked for discrepancies between the independent data extraction, and disagreements were resolved by discussion between the three authors. Our primary outcome was mortality at 30 days. We also extracted mortality data at 60 days, mortality during intensive care unit or hospital stay, and other mortality as defined by the authors. Wherever possible we categorised data on cardiovascular events as acute coronary syndrome, acute pulmonary oedema, peripheral ischaemia, and thrombotic events. The category of acute coronary syndrome included myocardial infarction, acute coronary syndrome, and cardiac arrest. Measures of general morbidity were use of packed red blood cells, adverse reactions to transfusion, incidence of in-hospital infections, measures of organ dysfunction, duration of intensive care unit or hospital stay, invasive ventilation, haemodynamic support, and renal support. We assessed the risk of bias using the method outlined in the Cochrane Collaboration Handbook for Systematic Reviews of Interventions.23 Risk of bias was assessed as high, low, and unclear for each of selection bias, performance bias, detection bias, attrition bias, and reporting bias. We specifically assessed blinding for the outcomes of cardiovascular events. All statistical analyses were performed using Review Manager 5.25 Meta-analysis was undertaken where data were sufficient. We used a random effect model as we anticipated that there would be substantial clinical heterogeneity. We reported relative risk ratios for dichotomous outcomes, with 95% confidence intervals. Median and interquartile ranges described non-parametric measures. We included one cluster randomised trial.26 However, we had no information on which clusters the patients with cardiovascular disease were in, and the intraclass correlation coefficient was 0.001 for mortality, suggesting that only 0.1% of the variance was due to the effect of the trial site and 99.1% to differences between patients. We performed a sensitivity analysis without taking the clustering into account, and this did not alter our results. These data were therefore included as unique patient data. Assessment of clinical heterogeneity included consideration of participant characteristics (eg, acute coronary syndrome versus chronic cardiovascular disease) and the clinical setting (critical care versus orthopaedics versus acute coronary syndrome). We undertook a subgroup analysis of patients with chronic cardiovascular disease, excluding trials including patients with ongoing acute coronary syndromes. Data were insufficient to undertake the preplanned subgroup analyses of critical care trials or of acute coronary syndromes. We assessed statistical heterogeneity of treatment effects between trials using the χ2 test. The I2 statistic was used to quantify the percentage of variability that was due to heterogeneity (we defined heterogeneity of >50% as moderate and >80% as substantial). Thirty trials were ineligible for inclusion. Six excluded patients with signs or symptoms of heart disease, cardiac disease with New York Heart Association Class (NYHA) II or above, and American Society of Anesthetists class (ASA) II or worse.32 33 34 35 36 37 Two trials targeted preoperative haemoglobin S levels in sickle cell anaemia and were therefore not relevant.38 39 Seven full text trials40 41 42 43 44 45 46 and eight abstracts27 47 48 49 50 51 52 53 did not include cardiovascular disease as a baseline characteristic. From the 41 potentially eligible trials, we were able to extract data on patients with cardiovascular disease from seven (n=2796).26 54 55 56 57 58 59 One of these trials published 30 day mortality data for patients with cardiovascular disease, and the authors responded to our request for further data on cardiovascular outcomes and general morbidity outcomes (n=32).59 From reported baseline demographic data we were aware that patients with cardiovascular disease were included in 11 further trials,60 61 62 63 64 65 66 67 68 69 70 but we were unable to extract any relevant data directly from the published text. After contact with the authors for any data on patients with cardiovascular disease in their trials, we were able to include data from four trials.66 67 68 69 We did not contact the authors of the seven trials and eight abstracts that did not mention cardiovascular disease as a baseline characteristic in their trial.27 40 41 42 43 44 45 46 47 48 49 50 51 52 53 Characteristics of all 29 eligible trials that are not included in this review can be found in supplementary table E1. In this review we included 11 transfusion threshold trials involving patients with cardiovascular disease (n=3033). Through data extraction, we were able to identify unique data for patients with cardiovascular disease for 3033 participants from 11 trials. The sample sizes of these trials varied from 4557 to 2015.55 Of the 3033 patients with cardiovascular disease, 1514 were randomised to restrictive transfusion thresholds and 1519 to liberal transfusion thresholds. 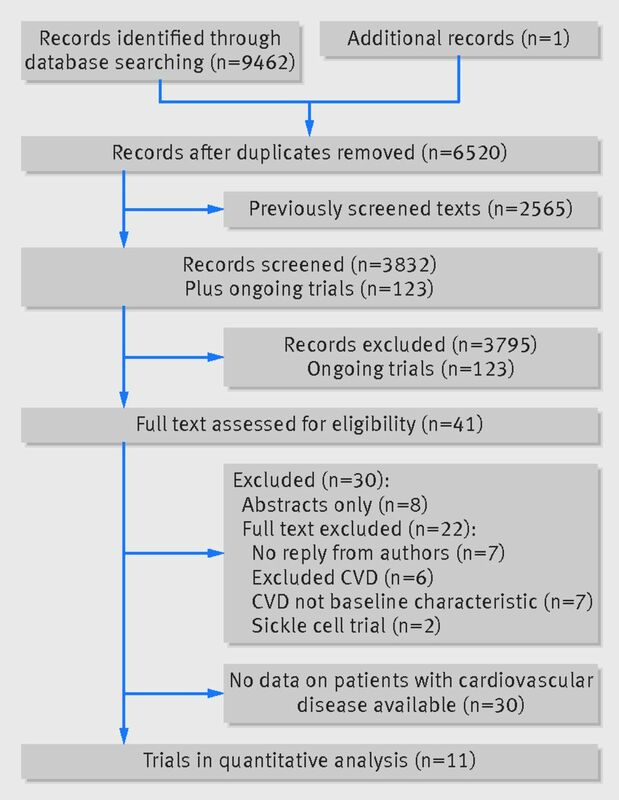 Six trials that included patients both with and without cardiovascular disease did not stratify their randomisation by the presence or absence of cardiovascular disease.12 26 58 66 67 69Table 1⇓ describes the characteristics of all included trials. Data on mortality were available from all 11 trials. Thirty day mortality was given for all trials except one, which reported 28 day mortality.26 Overall, 144 deaths (9.5%) occurred in the restrictive transfusion arms compared with 126 (8%) in the liberal transfusion arms (pooled effect estimate: risk ratio 1.15, 95% confidence interval 0.88 to 1.50, P=0.50, I2=14%, 3033 patients, fig 2⇓). We performed a subgroup analysis, including only trials where the randomisation was stratified for cardiovascular disease,54 55 56 57 59 and for this subgroup the relative risk was 0.96 (95% confidence interval 0.58 to 1.59, P=0.87, I2=14%). The sensitivity analysis in which the two trials including patients with acute coronary syndrome were excluded56 57 supported the result of the primary analysis (1.10, 0.88 to 1.37). The GRADE quality of evidence was judged to be moderate (table 2⇓). Nine trials presented data (2609 patients) on new cardiovascular events.54 55 56 57 58 59 66 67 68 The definition of myocardial infarction varied between trials (see supplementary table E4). All trials except two (definition unclear)58 66 required electrocardiographic changes with an increase or decrease of cardiac biomarkers using the third universal definition of myocardial infarction.7 Five trials also required symptoms consistent with myocardial ischaemia.17 55 57 67 68 The diagnosis of myocardial infarction was made by investigators in four trials,55 56 67 68 clinicians in three trials,57 59 66 and was unclear in two trials.54 58 The diagnosis was blinded in four trials,55 56 67 68 unblinded in three trials,57 59 66 and unclear in two trials.54 58 The incidence of acute coronary syndrome (fig 3⇓) ranged from 0%66 67 to 20.4%56 in the restrictive transfusion arms and 0%57 59 66 67 to 11.1%56 in the liberal transfusion arms. There was evidence of an increased incidence of acute coronary syndrome in patients in the restrictive transfusion arms compared with patients in the liberal transfusion arms (risk ratio 1.78, 95% confidence interval 1.18 to 2.70, P=0.01, I2=0%, restrictive transfusion: 59 events/1319 patients v liberal transfusion: 32 events/1290 patients). This corresponds to 4.6 episodes of acute coronary syndrome per 100 patients when using restrictive strategies and 2.7 per 100 patients when using liberal strategies. To prevent one episode of acute coronary syndrome, 52 patients would need to be treated with a liberal transfusion strategy. For the analysis of patients with acute pulmonary oedema, three trials had a higher incidence of acute pulmonary oedema in the liberal transfusion arms,57 58 66 whereas one trial had a higher incidence in the restrictive transfusion arm.56 There was no evidence of a different risk of acute pulmonary oedema in the restrictive transfusion arms compared with liberal transfusion arms (risk ratio 0.63, 95% confidence interval 0.22 to 1.81, P=0.39, I2=60%, fig 3⇑, restrictive: 24 events/309 patients v liberal: 47 events/340 patients). Two trials reported no new episodes of acute pulmonary oedema,66 67 and there was only one episode of acute pulmonary oedema, in one trial.59 Cerebrovascular and thrombotic events were rare in both restrictive and liberal transfusion arms and meta-analysis was not possible. Non-cardiovascular adverse events were reported across eight trials (see supplementary table E5).17 54 55 57 58 59 66 69 These endpoints were described differently in each paper owing to the different clinical settings and rationale of the trials. Six trials reported hospital length of stay for patients with cardiovascular disease.54 55 56 57 58 59 69 The difference between the restrictive and liberal transfusion arms was not significant (mean difference 1.24 days, 95% confidence interval −1.0 to 3.48, P=0.28, see supplementary figure E2). Three trials reported in-hospital infection, but the number of events was small (see supplementary table E2).56 66 71 One trial found no differences in organ support in a retrospective analysis of patients with cardiovascular disease (L Holst, personal communication, 2016),68 and no events were classified as adverse transfusion reactions. The risk of bias is summarised in figures 2 and 3⇓. The main category for high risk of bias was the lack of blinding of participants, clinical staff, and research staff (identified in six trials).26 55 57 58 59 68 The diagnosis of cardiovascular events is difficult in many of the settings in which trials took place, such as during critical illness, increasing the risk of performance bias in conjunction with unblinded outcome assessors. Another potential explanation for differing prevalence between trials was variations in definitions used (see supplementary table E4). Cardiovascular events were diagnosed by investigators in five trials56 57 58 67 68 and unblinded clinicians in three trials.57 59 66 The criteria for myocardial infarction were clearly defined in seven trials54 55 56 57 59 67 68 and were unclear in two trials.58 66 In only one trial was both the definition and the outcome assessment at high risk of bias,66 but no new cardiovascular events were diagnosed in this trial and its removal did not alter the analysis. 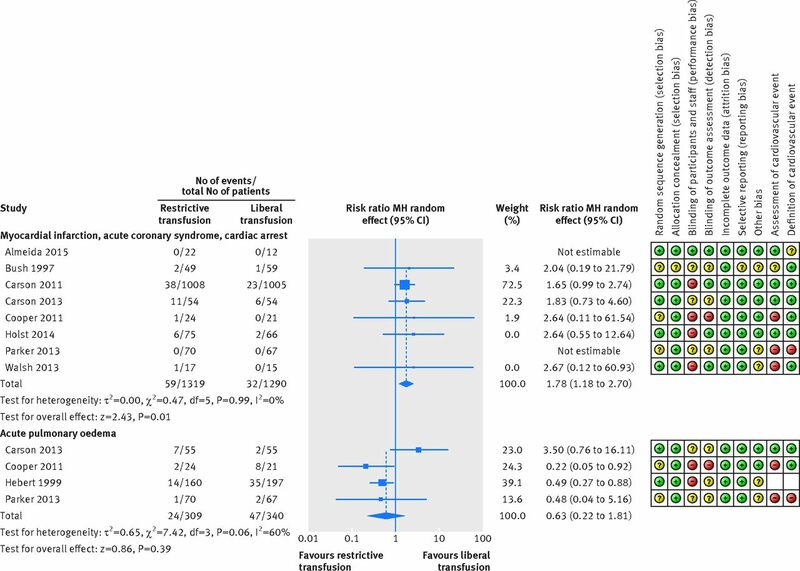 We identified data from 11 randomised trials that enrolled 3033 patients with cardiovascular disease in whom mortality data were available at 30 days, and nine trials that enrolled 2609 patients with cardiovascular disease in whom data on new cardiovascular events were available. A restrictive transfusion threshold was associated with an increased risk of acute coronary syndrome in patients with cardiovascular disease, with low heterogeneity between trials (moderate quality of evidence as assessed by GRADE). We found no evidence of a difference in 30 day mortality between restrictive and liberal transfusion groups. The incidence of pulmonary oedema did not differ between the transfusion thresholds, but heterogeneity was present between trials and the GRADE quality of evidence was judged to be very low. The length of hospital stay did not differ between restrictive and liberal transfusion strategies, and other outcomes were rare, with inadequate data for meta-analysis. The previous reviews in heterogeneous populations suggest overall trends towards lower 30 day mortality with restrictive transfusion strategies (range of risk ratio 0.85, 95% confidence interval 0.70 to 1.0313 to 0.92, 0.67 to 1.26),11 whereas the effect we observed in patients with cardiovascular disease was in the direction favouring liberal transfusion, but without statistical significance (1.10, 0.84 to 1.44). We specifically excluded trials in cardiac surgery as this is comprises a distinct group of patients with a cardiovascular risk that has been altered profoundly by their procedure. A recent large multicentre randomised controlled trial in cardiac surgery74 found no difference in a composite morbidity outcome, but the 90 day mortality rate was significantly higher in the restrictive transfusion group compared with liberal transfusion group. A recent systematic review and meta-analysis restricted to trials in cardiac surgery also found increased mortality with restrictive transfusion thresholds.18 Another systematic review75 of perioperative randomised controlled trials of transfusion practice (including cardiac surgery) also found higher mortality with a restrictive transfusion threshold, although the prevalence of cardiovascular disease in these trials was uncertain. These data suggest that the presence of cardiovascular disease may modify the effect of transfusion practice on clinical outcomes considerably, and the data highlight the need for better evidence for this prevalent patient group. We found that new onset acute coronary syndrome occurred more often with restrictive transfusion strategies. The pooled estimates were 2.7% for liberal transfusion compared with 4.6% for restrictive transfusion (number needed to treat approximately 52 to prevent an acute coronary syndrome with more liberal transfusion). The variation in patient populations, transfusion strategies compared, and method of ascertaining acute coronary syndrome create substantial uncertainty in these estimates, but the heterogeneity between trials was low. The estimate of effect was the same when the largest trial was removed. Importantly, for most included cases the restrictive transfusion threshold was 80 g/L compared with a liberal transfusion threshold of 100 g/L. These findings suggest that a transfusion threshold of 70 g/L, which is widely recommended as the “default” threshold, may not be as safe as higher thresholds for preventing acute coronary syndrome in patients with cardiovascular disease. The safest haemoglobin threshold is uncertain and may be patient specific, but we have shown potential for harm with restrictive triggers less than 80 g/L. Further trials are needed to inform the optimal transfusion strategy in patients with cardiovascular disease. Myocardial injury could have an effect on other important clinical outcomes such as length of hospital stay, quality of life, longer term mortality, and healthcare costs, but few trials have measured these outcomes. These outcomes, together with cost effectiveness, should be included in future research, particularly as the cost of blood transfusions is relatively low and even in the liberal transfusion arm in this review patients typically received only two or three units. Our review highlights the variability in diagnostic definitions of acute coronary syndrome and the potential for ascertainment bias in clinical trials where blinding of intervention groups is difficult. This resulted in low evidence of quality according to GRADE, and it highlights the need for further high quality research. We found no effect on acute pulmonary oedema, but the numbers of trials and patients in whom this outcome was reported was small and the findings were heterogeneous. Acute pulmonary oedema can result from multiple causes, including transfusion associated circulatory overload, and the potential for an effect in a different direction from acute coronary syndrome made it important to consider these outcomes separately rather than to include them as a composite. Future trials should standardise diagnostic methods for both acute coronary syndrome and acute pulmonary oedema and attempt to blind outcome assessors to group allocation. Our review has several limitations. There was clinical diversity between trial populations—for example, between orthopaedic surgery and critical care. The risk-benefit balance may vary between clinical situations (for example, as a result of the degree and duration of physiological stress). The restrictive and liberal transfusion thresholds varied between trials, and the cut-off values actually overlapped (restrictive threshold 70-97 g/L; liberal threshold 90-113 g/L), which reduces the validity of pooling data across all trials. Exposure to anaemia would have been considerably longer in the four intensive care unit trials than in the four surgical trials, in which the presence of anaemia would have been relatively short. Definitions of cardiovascular disease varied, and inclusion criteria for some trials were restricted to ischaemic heart disease or acute coronary syndrome. However, the direction of effect was consistently in favour of a liberal transfusion threshold for reducing new acute coronary syndrome events across the trials. Finally, some authors did not respond to our request for data on their participants with cardiovascular disease, and this reduced the precision of our point estimates. This review of available evidence suggests that for anaemic patients with cardiovascular disease, the use of restrictive transfusion thresholds (typically a haemoglobin level of 70-80 g/L) is associated with higher rates of acute coronary syndrome than more liberal transfusion thresholds (typically 90-100 g/L). No effects on mortality or other important outcomes were found. The currently available quality of evidence for all outcomes was low. These data support the use of a more liberal transfusion threshold (>80 g/L) for patients with both acute and chronic cardiovascular disease, until adequately powered high quality randomised trials have been undertaken in this patient population. Contributors: ABD, RO’D, SB, MT, TSW, and SJS conceived and designed the study. Acquisition, analysis, or interpretation of the data: ABD, RO’D, SB, CD, TSW, SJS, LH, MP, and MG acquired, analyses, and interpreted the data. ABD, R’OD, SB, TSW, and SJS drafted the manuscript. ABD and MT carried out the statistical analysis. TSW and SJS supervised the study. ABD had full access to all of the data in the study and takes responsibility for the integrity of the data and the accuracy of the data analysis. Transparency: ABD affirms that this manuscript is an honest, accurate, and transparent account of the study being reported; that no important aspects of the study have been omitted; and that any discrepancies from the study as planned (and, if relevant, registered) have been explained. Vincent JL, Baron J-F, Reinhart K, et al. ABC (Anemia and Blood Transfusion in Critical Care) Investigators. Anemia and blood transfusion in critically ill patients. JAMA2002;288:1499-507. doi:10.1001/jama.288.12.1499. pmid:12243637. Carson J, Duff A, Poses R, et al. Effect of anaemia and cardiovascular disease on surgical mortality and morbidity. Lancet1996;348:1055-60. doi:10.1016/S0140-6736(96)04330-9. pmid:8874456. Wu W-C, Rathore SS, Wang Y, Radford MJ, Krumholz HM. Blood transfusion in elderly patients with acute myocardial infarction. N Engl J Med2001;345:1230-6. doi:10.1056/NEJMoa010615. pmid:11680442. Horwich TB, Fonarow GC, Hamilton MA, MacLellan WR, Borenstein J. Anemia is associated with worse symptoms, greater impairment in functional capacity and a significant increase in mortality in patients with advanced heart failure. J Am Coll Cardiol2002;39:1780-6. doi:10.1016/S0735-1097(02)01854-5. pmid:12039491. Sabatine MS, Morrow DA, Giugliano RP, et al. Association of hemoglobin levels with clinical outcomes in acute coronary syndromes. Circulation2005;111:2042-9. doi:10.1161/01.CIR.0000162477.70955.5F pmid:15824203. Thygesen K, Alpert JS, Jaffe AS, et al. Joint ESC/ACCF/AHA/WHF Task Force for Universal Definition of Myocardial Infarction. Authors/Task Force Members Chairpersons; Biomarker Subcommittee; ECG Subcommittee; Imaging Subcommittee; Classification Subcommittee; Intervention Subcommittee; Trials & Registries Subcommittee; Trials & Registries Subcommittee; Trials & Registries Subcommittee; Trials & Registries Subcommittee; ESC Committee for Practice Guidelines (CPG); Document Reviewers. Third universal definition of myocardial infarction. J Am Coll Cardiol2012;60:1581-98. doi:10.1016/j.jacc.2012.08.001 pmid:22958960. Ostermann M, Lo J, Toolan M, et al. A prospective study of the impact of serial troponin measurements on the diagnosis of myocardial infarction and hospital and six-month mortality in patients admitted to ICU with non-cardiac diagnoses. Crit Care2014;18:R62. doi:10.1186/cc13818 pmid:24708826. Nagele P, Brown F, Gage BF, et al. High-sensitivity cardiac troponin T in prediction and diagnosis of myocardial infarction and long-term mortality after noncardiac surgery. Am Heart J2013;166:325-332.e1. doi:10.1016/j.ahj.2013.04.018. pmid:23895816. Botto F, Alonso-Coello P, Chan MT, et al. Myocardial injury after noncardiac surgery: a large, international, prospective cohort study establishing diagnostic criteria, characteristics, predictors, and 30-day outcomes. Anesthesiology2014;120:564-78. doi:10.1097/ALN.0000000000000113. pmid:24534856. Brunskill SJ, Millette SL, Shokoohi A, et al. Red blood cell transfusion for people undergoing hip fracture surgery. Cochrane Database Syst Rev2015;4:CD009699.pmid:25897628. Holst LB, Petersen MW, Haase N, Perner A, Wetterslev J. Restrictive versus liberal transfusion strategy for red blood cell transfusion: systematic review of randomised trials with meta-analysis and trial sequential analysis. BMJ2015;350:h1354. doi:10.1136/bmj.h1354. pmid:25805204. Carson JL, Carless PA, Hebert PC. Transfusion thresholds and other strategies for guiding allogeneic red blood cell transfusion. Cochrane Database Syst Rev2012;4:CD002042.pmid:22513904. Association of Anaesthetists of Great Britain and Ireland. Blood Transfusion and the Anaesthetist: Red Cell Transfusion 2. London; 2008. Carson JL, Grossman BJ, Kleinman S, et al. Clinical Transfusion Medicine Committee of the AABB. Red blood cell transfusion: a clinical practice guideline from the AABB*. Ann Intern Med2012;157:49-58. doi:10.7326/0003-4819-157-1-201206190-00429. pmid:22751760. Norfolk DD, ed. Joint UK blood transfusion and tissue transplantation services professional advisory committee. Handbook of Transfusion Medicine.TSO, 2013. Retter A, Wyncoll D, Pearse R, et al. British Committee for Standards in Haematology. Guidelines on the management of anaemia and red cell transfusion in adult critically ill patients. Br J Haematol2013;160:445-64. doi:10.1111/bjh.12143. pmid:23278459. Patel NN, Avlonitis VS, Jones HE, Reeves BC, Sterne JA, Murphy GJ. Indications for red blood cell transfusion in cardiac surgery: a systematic review and meta-analysis. Lancet Haematol2015;2:e543-53. doi:10.1016/S2352-3026(15)00198-2 pmid:26686409. Moher D, Liberati A, Tetzlaff J, Altman DG. PRISMA Group. Preferred reporting items for systematic reviews and meta-analyses: the PRISMA statement. PLoS Med2009;6:e1000097. doi:10.1371/journal.pmed.1000097 pmid:19621072. Wilkinson KL, Brunskill SJ, Dorée C, et al. The clinical effects of red blood cell transfusions: an overview of the randomized controlled trials evidence base. Transfus Med Rev2011;25:145-155.e2. doi:10.1016/j.tmrv.2010.11.006 pmid:21345644. Shunemann H, Oxman A, Vist G, Higgins J, Deeks J, Glasziou P. Interpreting results and drawing conclusions. In: The Cochrane Collaboration. Cochrane Handbook for Systematic Reviews of Interventions Version 510 [updated March 2011]. 2011. The Cochrane Collaboration. Review Manager (RevMan).The Nordic Cochrane Centre, 2014. Jairath V, Kahan BC, Gray A, et al. Restrictive versus liberal blood transfusion for acute upper gastrointestinal bleeding (TRIGGER): a pragmatic, open-label, cluster randomised feasibility trial. Lancet2015;386:137-44. doi:10.1016/S0140-6736(14)61999-1 pmid:25956718. Wu Q. Clinical research of restrictive transfusion in elderly patients undergoing orthopedic surgery. www.chictr.org.cn/showprojen.aspx?proj=8714. Tay J, Tinmouth A, Fergusson D, Allan D. Transfusion of red cells in hematopoietic stem cell transplantation (TRIST): study protocol for a randomized controlled trial. Trials2011;12:207. doi:10.1186/1745-6215-12-207 pmid:21936907. Buckstein R. Red blood cell transfusion thresholds and QOL in MDS (EnhanceRBC). https://clinicaltrials.gov/ct2/show/NCT01079247. Palmieri TL. A trial of restrictive versus traditional blood transfusion practices in burn patients. https://clinicaltrials.gov/ct2/show/NCT01079247. Matot I. Restrictive versus liberal red cell transfusion strategy in orthopedic-oncology patients undergoing surgery—a randomized controlled study. https://clinicaltrials.gov/ct2/show/NCT01491308. Grover M, Talwalkar S, Casbard A, et al. Silent myocardial ischaemia and haemoglobin concentration: a randomized controlled trial of transfusion strategy in lower limb arthroplasty. Vox Sang2006;90:105-12. doi:10.1111/j.1423-0410.2006.00730.x. pmid:16430668. Zheng H, Wu J-J, Wang J. Evaluation of effectiveness and analysis of goal-directed blood transfusion in peri-operation of major orthopedic surgery in elderly patients. Exp Ther Med2013;5:511-6.pmid:23403611. Webert KE, Cook RJ, Couban S, et al. A multicenter pilot-randomized controlled trial of the feasibility of an augmented red blood cell transfusion strategy for patients treated with induction chemotherapy for acute leukemia or stem cell transplantation. Transfusion2008;48:81-91.pmid:17894791. Prick BW, Jansen AJ, Steegers EA, et al. Transfusion policy after severe postpartum haemorrhage: a randomised non-inferiority trial. BJOG2014;121:1005-14. doi:10.1111/1471-0528.12531 pmid:24405687. Nielsen K, Dahl B, Johansson PI, Henneberg SW, Rasmussen LS. Intraoperative transfusion threshold and tissue oxygenation: a randomised trial. Transfus Med2012;22:418-25. doi:10.1111/j.1365-3148.2012.01196.x pmid:23121563. Liu DX, Liu J, Zhang F, Zhang Q-Y, Xie M, Zhu Z-Q. Randomized controlled study on safety and feasibility of transfusion trigger score of emergency operations. Chin Med J (Engl)2015;128:1801-8. doi:10.4103/0366-6999.159357. pmid:26112723. Koshy M, Burd L, Wallace D, Moawad A, Baron J. Prophylactic red-cell transfusions in pregnant patients with sickle cell disease. A randomized cooperative study. N Engl J Med1988;319:1447-52. doi:10.1056/NEJM198812013192204. pmid:3054555. Haberkern CM, Neumayr LD, Orringer EP, et alCholecystectomy in sickle cell anemia patients: perioperative outcome of 364 cases from the National Preoperative Transfusion Study. Blood1997;89:1533-42. Bergamin F, Almeida J, Park C, Osawa E, Silva J, Galas F, et al. Transfusion requirements in septic shock patients: a randomized controlled trial. Crit Care 2014;18:112. http://link.springer.com/article/10.1186%2Fcc13302. Blair SD, Janvrin SB, McCollum CN, Greenhalgh RM. Effect of early blood transfusion on gastrointestinal haemorrhage. Br J Surg1986;73:783-5. doi:10.1002/bjs.1800731007. pmid:3533203. Fortune JB, Feustel PJ, Saifi J, Stratton HH, Newell JC, Shah DM. Influence of hematocrit on cardiopulmonary function after acute hemorrhage. J Trauma1987;27:243-9. doi:10.1097/00005373-198703000-00003. pmid:3560265. Lotke PA, Barth P, Garino JP, Cook EF. Predonated autologous blood transfusions after total knee arthroplasty: immediate versus delayed administration. J Arthroplasty1999;14:647-50. doi:10.1016/S0883-5403(99)90216-4. pmid:10512433. Robertson CS, Hannay HJ, Yamal J-M, et al. Epo Severe TBI Trial Investigators. Effect of erythropoietin and transfusion threshold on neurological recovery after traumatic brain injury: a randomized clinical trial. JAMA2014;312:36-47. doi:10.1001/jama.2014.6490. pmid:25058216. Villanueva C, Colomo A, Bosch A, et al. Transfusion strategies for acute upper gastrointestinal bleeding. N Engl J Med2013;368:11-21. doi:10.1056/NEJMoa1211801 pmid:23281973. Zygun DA, Nortje J, Hutchinson PJ, Timofeev I, Menon DK, Gupta AK. The effect of red blood cell transfusion on cerebral oxygenation and metabolism after severe traumatic brain injury. Crit Care Med2009;37:1074-8. doi:10.1097/CCM.0b013e318194ad22 pmid:19237920. Colomo A, Hernandez-Gea V, Muniz-Diaz E, Madoz P, Aracil C, Alarez-Urturi C. Transfusion strategies in patients with cirrhosis and acute gastrointestinal bleeding[abstract]. Hepatology2008;48(Suppl):413A. Hochain P, Merle V, Tuil S, et al. Transfusion for variceal bleeding in cirrhotic patients[letter]. Gut1996;38:154. doi:10.1136/gut.38.1.154. pmid:8566849. So-Osman C. A restrictive transfusion trigger is a method for blood saving in elective orthopaedic surgery[abstract]. Vox Sang2004;87(Suppl 3):52.pmid:15209879. Weiss GB, Patten E, Alperin JB, et al. Hypertransfusion for adult acute leukaemia[letter]. Lancet1982;1:105. doi:10.1016/S0140-6736(82)90239-2. pmid:6119468. Park SH, Nam E, Bang SM, Cho EK, Shin DB, Lee JH. A randomized trial of anemia correction with two different hemoglobin targets in the first-line chemotherapy of advanced gastric cancer. Cancer Chemother Pharmacol2008;62:1-9. doi:10.1007/s00280-007-0561-1. pmid:17690882. Villarejo F, Rizzolo M, Lópéz E, Domeniconi G, Arto G, Apezteguia C. [Acute anemia in high digestive hemorrhage. Margins of security for their handling without transfusion of red globules]. Acta Gastroenterol Latinoam1999;29:261-70.pmid:10599402. Palmer J, Maciver C, Scott R, Picken M, McClelland D, Keating J, et al Hip fracture and transfusion trial (HATT) [abstract]. Transfus Med1998;8:52. Bush RL, Pevec WC, Holcroft JW. A prospective, randomized trial limiting perioperative red blood cell transfusions in vascular patients. Am J Surg1997;174:143-8. doi:10.1016/S0002-9610(97)00073-1 pmid:9293831. Carson JL, Terrin ML, Noveck H, et al. FOCUS Investigators. Liberal or restrictive transfusion in high-risk patients after hip surgery. N Engl J Med2011;365:2453-62. doi:10.1056/NEJMoa1012452. pmid:22168590. Carson JL, Brooks MM, Abbott JD, et al. Liberal versus restrictive transfusion thresholds for patients with symptomatic coronary artery disease. Am Heart J2013;165:964-971.e1. doi:10.1016/j.ahj.2013.03.001 pmid:23708168.
Cooper HA, Rao SV, Greenberg MD, et al. Conservative versus liberal red cell transfusion in acute myocardial infarction (the CRIT Randomized Pilot Study). Am J Cardiol2011;108:1108-11. doi:10.1016/j.amjcard.2011.06.014 pmid:21791325. Hébert PC, Wells G, Blajchman MA, et al. A multicenter, randomized, controlled clinical trial of transfusion requirements in critical care. Transfusion Requirements in Critical Care Investigators, Canadian Critical Care Trials Group. N Engl J Med1999;340:409-17. doi:10.1056/NEJM199902113400601. pmid:9971864. Walsh TS, Boyd JA, Watson D, et al. RELIEVE Investigators. Restrictive versus liberal transfusion strategies for older mechanically ventilated critically ill patients: a randomized pilot trial. Crit Care Med2013;41:2354-63. doi:10.1097/CCM.0b013e318291cce4 pmid:23939351. Carson JL, Terrin ML, Barton FB, et al. A pilot randomized trial comparing symptomatic vs. hemoglobin-level-driven red blood cell transfusions following hip fracture. Transfusion1998;38:522-9. doi:10.1046/j.1537-2995.1998.38698326331.x. pmid:9661685. Fan Y-X, Liu F-F, Jia M, et al. Comparison of restrictive and liberal transfusion strategy on postoperative delirium in aged patients following total hip replacement: a preliminary study. Arch Gerontol Geriatr2014;59:181-5. doi:10.1016/j.archger.2014.03.009 pmid:24745810. Hébert PC, Wells G, Marshall J, et al. Canadian Critical Care Trials Group. Transfusion requirements in critical care. A pilot study. JAMA1995;273:1439-44. doi:10.1001/jama.1995.03520420055038. pmid:7723158. Foss NB, Kristensen MT, Jensen PS, Palm H, Krasheninnikoff M, Kehlet H. The effects of liberal versus restrictive transfusion thresholds on ambulation after hip fracture surgery. Transfusion2009;49:227-34. doi:10.1111/j.1537-2995.2008.01967.x pmid:19389209. Mazza BF, Freitas FGR, Barros MMO, Azevedo LCP, Machado FR. Blood transfusions in septic shock: is 7.0 g/dL really the appropriate threshold?Rev Bras Ter Intensiva2015;27:36-43. doi:10.5935/0103-507X.20150007 pmid:25909311. Nielsen K, Johansson PI, Dahl B, et al. Perioperative transfusion threshold and ambulation after hip revision surgery--a randomized trial. BMC Anesthesiol2014;14:89. doi:10.1186/1471-2253-14-89 pmid:25337035. Parker MJ. Randomised trial of blood transfusion versus a restrictive transfusion policy after hip fracture surgery. Injury2013;44:1916-8. doi:10.1016/j.injury.2013.04.033 pmid:23756263. De Almeida JP, Vincent JL, Galas FR, et al. Transfusion requirements in surgical oncology patients: a prospective, randomized controlled trial. Anesthesiology2015;122:29-38. doi:10.1097/ALN.0000000000000511. pmid:25401417. Holst LB, Haase N, Wetterslev J, et al. TRISS Trial Group Scandinavian Critical Care Trials Group. Lower versus higher hemoglobin threshold for transfusion in septic shock. N Engl J Med2014;371:1381-91. doi:10.1056/NEJMoa1406617 pmid:25270275. Gregersen M, Borris LC, Damsgaard EM. Postoperative blood transfusion strategy in frail, anemic elderly patients with hip fracture: the TRIFE randomized controlled trial. Acta Orthop2015;86:363-72. doi:10.3109/17453674.2015.1006980 pmid:25586270. So-Osman C, Nelissen R, Te Slaa R, Coene L, Brand R. Brand A. A randomized comparison of transfusion triggers in elective orthopaedic surgery using leucocyte-depleted red blood cells. Vox Sang2010;98:56-64.doi:10.1111/j.1423-0410.2009.01225.x. Gregersen M, Damsgaard EM, Borris LC. Blood transfusion and risk of infection in frail elderly after hip fracture surgery: the TRIFE randomized controlled trial. Eur J Orthop Surg Traumatol.Springer Paris, 2015. Deans KJ, Minneci PC, Suffredini AF, et al. Randomization in clinical trials of titrated therapies: unintended consequences of using fixed treatment protocols. Crit Care Med2007;35:1509-16. doi:10.1097/01.CCM.0000266584.40715.A6. pmid:17440420. Walsh TS, McClelland DB, Lee RJ, et al. ATICS Study Group. Prevalence of ischaemic heart disease at admission to intensive care and its influence on red cell transfusion thresholds: multicentre Scottish Study. Br J Anaesth2005;94:445-52. doi:10.1093/bja/aei073 pmid:15708870. Murphy GJ, Pike K, Rogers CA, et al. TITRe2 Investigators. Liberal or restrictive transfusion after cardiac surgery. N Engl J Med2015;372:997-1008. doi:10.1056/NEJMoa1403612 pmid:25760354. Fominskiy E, Putzu A, Monaco F, et al. Liberal transfusion strategy improves survival in perioperative but not in critically ill patients. A meta-analysis of randomised trials. Br J Anaesth2015;115:511-9. doi:10.1093/bja/aev317 pmid:26385661.